Cathedral Preparatory School and Seminary is a Roman Catholic, college preparatory educational community under the auspices of the Diocese of Brooklyn. As a high school, Cathedral forms the mind in ways of academic excellence through a personalized, superior education where growth in maturity and grace are encouraged and fostered. Through a program of individualized instruction and support, students are challenged to achieve academic greatness. As a seminary, Cathedral affirms the uniqueness and dignity of an individual vocation, specifically providing an environment for a young man to discern a vocation to the diocesan priesthood, while forming all students to become strong and dedicated leaders in the Church and the world by the development of heroic virtue and belief. + Our priority is forming men to know and love Jesus. + Daily Mass and weekly Eucharistic Adoration are at the core of the school’s schedule. + Our students are taught about all vocations, including priesthood and marriage – all are formed to be Christian leaders. 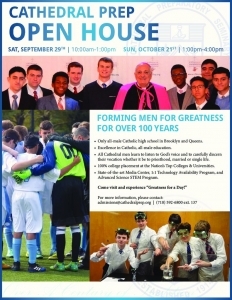 + Cathedral Prep is a small, all male high school offering a highly personalized, one-on-one education. + A selective admission process yields approximately 40 – 50 new students per year. + Our teachers create an intimate learning atmosphere in which they adapt to the various learning styles of students. + At Cathedral Prep, exceptional students are challenged to meet their full potentials. + Greatness is expected from every student. + Course offerings include a full battery of Advanced Placement classes including World History, US History, and English Literature. + Through a partnership with St. John’s University, students have the opportunity to graduate with up to 21 college credits. + One third of students receive scholarships and tuition assistance. + Through physical activity and healthy competition, students grow stronger in mind and body while developing the qualities of leadership and sportsmanship. + Our interscholastic program includes: Baseball, Basketball, Bowling, Cross Country, Forensics (Speech and Debate), Soccer, and Track and Field. + One of Cathedral’s greatest strengths is a spirit of unrivaled fraternity and acceptance among the students. + Every student belongs to a fraternity led by a faculty mentor who provides the foundation for student support, competition, and brotherhood. + Cathedral Prep has a 100% graduation and college acceptance rate with students going on to enroll at West Point, Harvard, University of Pennsylvania, NYU, St. John’s University, and dozens of other top notch universities. + Every academic year, our small graduating classes consistently earn at least 1.5 million dollars in scholarship offers. + Alumni have a strong presence at Cathedral; the entire administration and about one third of the faculty are graduates. We have a century of tradition that is being passed on from teacher to student!